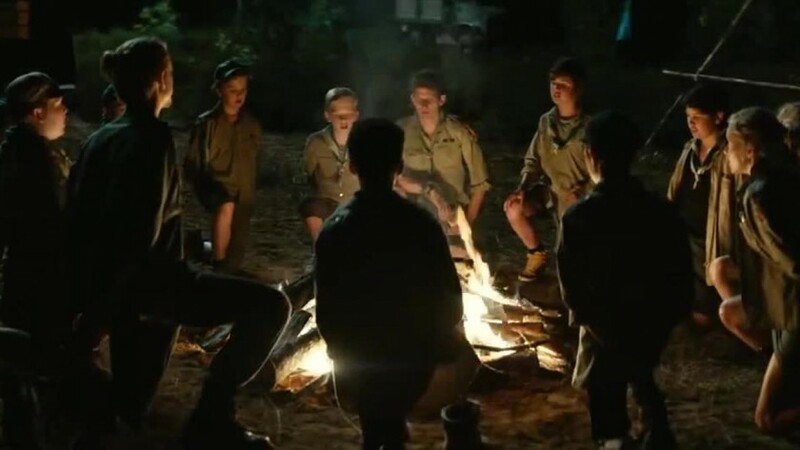 Flemish filmmaker Jonas Govaerts debut feature Cub focuses on a group of scouts on a typical woodland camping expedition. But these are no ordinary woods and our impressionable young lead Sam (Maurice Luijten) is no ordinary boy. The aforemetioned 12 year old is joined by three cub scout leaders in their mid-twenties, the mischievous and immature Baloo – Peter (Stef Aerts), the kind-hearted but too permissive Akela – Kris (Titus De Voogdt, Steve + Sky) and cook/dual love interest Jasmijn (Evelien Bosmans). The leaders and their pack of scouts head out to a camping site in the French woods. A site that some yob locals and the comical regional police officer are all reluctant to cross into due to rumours that the ghosts of former bus factory workers remain in the forest after they hung themselves following its closure. An admittedly pretty thin narrative set up from which the action springboards later. On the surface Sam seems to possess the kind of heart and innocence you can route for. But as an outsider he is an obvious target of bullying from the more obnoxious scouts in the pack. The leaders decide to scare the cubs with the obligatory campfire ghost story concerning the legend of Kai, a “half boy, half werewolf” creature responsible for the disappearance of a young couple in the very woods they are camping in. As things begin to go missing in the camp site, Sam begins to try to track down the fictional Kai, determined to resolve the mystery. Unbeknownst to the others although not supernatural not only is Kai not just a legend, but Sam tracks down the feral boy to his hideout overlooking the camp. He even begins to strike up an uneasy friendship with Kai, helping him get food (after he steals dog food). But this isn’t The Jungle Book and Kai’s primal actions begin to mould and form the already damaged Sam. The continued humiliation metered out to Sam by Peter comes to a head when he sets his dog on him for (unwittingly) watching him fooling around with Jasmijn. This cruelty is more than reciprocated when later on Kai snares the dog in a hanging sack and encourages Sam to unleash his primal rage on the ill-fated pooch. Whilst Kai and Sam begin their The Wasp Factory re-enactments, we get occasional glimpses of Kai’s adult master as he orchestrates the events happening outside of the scout camp. The Leatherface-esque sadist sets off a number of ingenious traps to lure and kill his forest victims (almost like Saw meets The Great Outdoors). From the point Peter discovers his dead dog all key relationships within the camp begin to unravel. Kris struggles to control the abusive and irrational Peter as well as justify the actions of the increasingly errant Sam; while Lizzie fights to keep the whole group together. In truth the actions of Kai and Sam are soon the least of their worries, as Kai’s sadistic master begins to turn his attention to the cub pack themselves. Sam seems to offer the only hope of a stopping this hulking man monster, having tracked Kai back to his master’s hidden dwelling within the carcass of the old factory. At first he is more than a willing adversary, but as the final reign of terror begins, the lines begin to blur. Cub, whilst thin on underlying narrative is beautifully filmed thanks to the expert cinematography of Nicolas Karakatsanis (The Drop, Bullhead). With little exposition the film’s events unfold quickly and the momentum rarely drops throughout. The acting and characterisations are darkly comical without being cartoonish, with most of the key protagonists proving more than one dimensional. Jonas Govaerts dark tale has enough gore and playfully brutal set ups to keep most horror fans happy, but it’s the final stomach churning twists that Govaert delivers towards the end that really set this film apart from most woodland based slasher films. Cub manages to tap into something disturbingly visceral about human nature, spitefully deconstructing the notions of childhood, nature and nurture. Proving to be one of the best horror films of 2015 so far.